Re: Disable horizontal scrolling with Elantech Trackpoint? My question concerns middle-button-scrolling for the Trackpoint on the Yoga 260, which seems to use an Elantech device and driver. Most of the time when I try to use the middle button to scroll, it starts off trying to scroll horizontally, which I then have to overcome to scroll vertically. It takes a lot of time and makes it easy to overshoot. I've been playing around with registry settings and the INI file, but haven't been able to figure it out. Does anyone have any suggestions? I would be OK with disabling horizontal scrolling entirely. no ideas, I have tried everything. Adjusting the sensivity of the TrackPoint or reseating the TrackPoint cap and turning it around 90 degrees each. The last procedure reseating the TrackPoint cap helps a little. But the issue still exists. i've got the same issue with a new thinkpad 260. can't find any info on solving this. tried reinstalling the drivers, but that hasn't helped. i feel your pain-the default to horizontal scroll causes it to jump as one's got to overcome it to scroll vertically. I have the Alps trackpoint. When I press the "third button" the pointer changed to the "Vertical scroll icon", if I move the trackpint to the left/right it will change to "horizontal scroll". How does your icon change when you press the third button without any preassure on the trackpoint ? Using the latest driver and BIOS. When I first press the button, the vertical scroll icon appears. But if I don't hit the Trackpoint *just right* it goes into horizontal scroll mode, then I have to push harder and more deliberately down to get it to jump back to vertical mode. This just makes it jump several pages down, then I have to scroll back up. It's really maddening. I want to disable the horizontal scrolling function entirely. Seeing the same problem with a Yoga 460 Type 20EM shipped early April 2017 when trying to scroll vertical and it flips to horizontal. 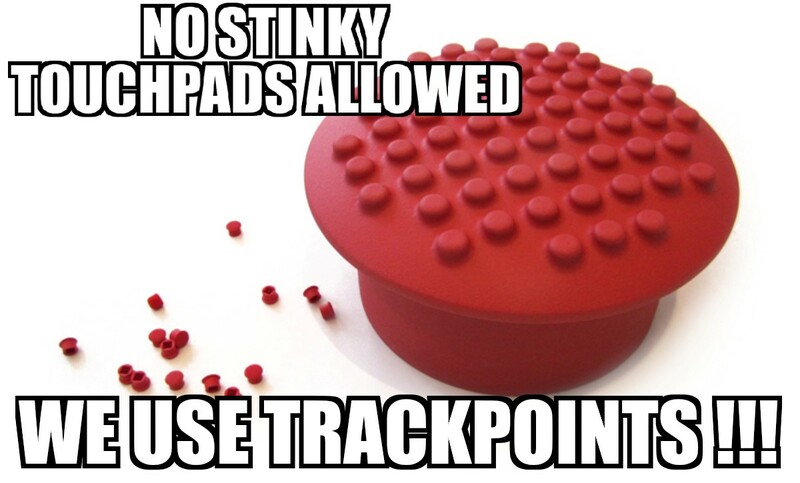 Tried changing trackpoint sensitivity and that does not improve it. (Don't try changing it to the firmest touch unless you want to feel like you are trying to wrestle a gorilla!) All the latest drivers have been installed. Really frustrating trying to re-attempt the scroll action several times until it finally decides to stay vertical. Never had this problem on any previous Trackpoints going all the way back to ThinkPad 600 models. WIn 8.1 and win 10 same issue.